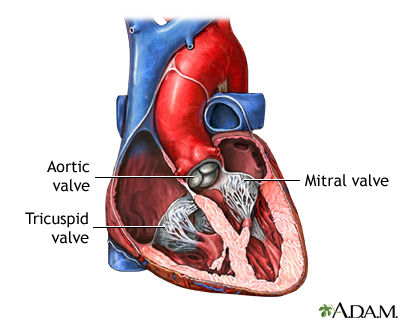 Heart surgery is any surgery done on the heart muscle, valves, arteries, or the aorta and other large arteries connected to the heart. The term "open heart surgery" means that you are connected to a heart-lung bypass machine, or bypass pump during surgery. New procedures are being done on the heart through smaller cuts. Some new procedures are being done while the heart is still beating. Omer S, Cornwell LD, Bakaeen FG. Acquired heart disease: coronary insufficiency. In: Townsend CM Jr, Beauchamp RD, Evers BM, Mattox KL, eds. Sabiston Textbook of Surgery. 20th ed. Philadelphia, PA: Elsevier Saunders; 2017:chap 59. Dale Mueller, MD, cardiovascular and thoracic surgeon, HeartCare Midwest; Chairman Department of Cardiovascular Medicine and Surgery, OSF St. Francis Medical Center; and Clinical Associate Professor of Surgery, University of Illinois, Peoria, IL. Internal review and update on 07/24/2016 by David Zieve, MD, MHA, Isla Ogilvie, PhD, and the A.D.A.M. Editorial team. Editorial update 11/11/2016.